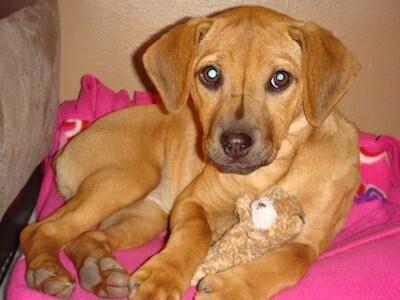 "Our Shar Pei Beagle mix is a 1 1/2 year old girl dog, and weighs about 35 pounds. 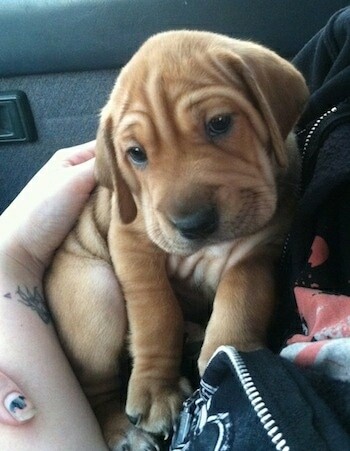 Her mother is a purebred Beagle and her father is a purebred Shar Pei. She has a great temperament especially with children. 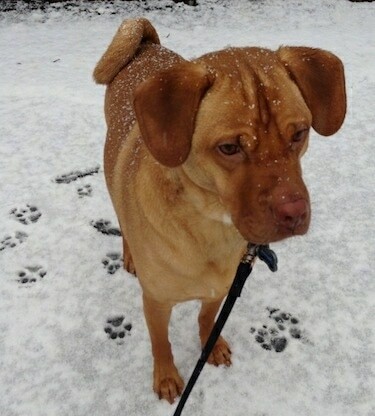 Everywhere we take her, she attracts lots of attention, everyone wants to know what breed she is and people are surprised when they find out she is a Shar Pei Beagle mix. She has very soft fur with minimal shedding. She loves to be outside and everywhere you are. 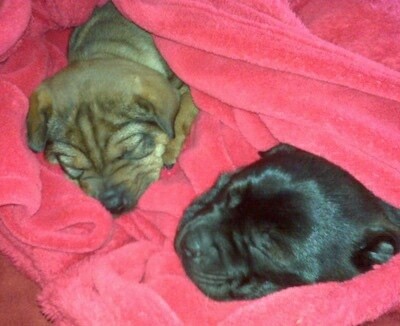 This is a great mix because the Shar Pei and Beagle balance each other out. 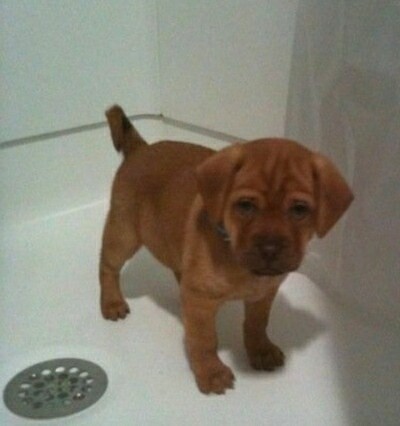 We do not have the skin problems of the purebred Shar Pei and she does not howl like the Beagle. We walk her at least 1 mile a day and she must be on a leash or the first squirrel or chipmunk that happens by will send her chasing after it. She does walk with her nose to ground like a Beagle does. She seems to only bark when someone comes to the door and stops once she knows everything is OK or when she sees a squirrel or chipmunk running past her while outside." The Sharp Eagle is not a purebred dog. 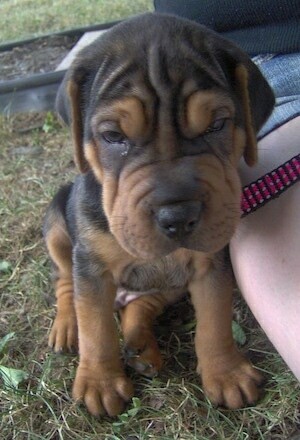 It is a cross between the Beagle and the Shar-Pei. The best way to determine the temperament of a mixed breed is to look up all breeds in the cross and know you can get any combination of any of the characteristics found in either breed. Not all of these designer hybrid dogs being bred are 50% purebred to 50% purebred. It is very common for to breed multi-generation crosses. Lilly the Sharp Eagle as a 6-week-old puppy—"I picked up my puppy Lilly when she was only 6 weeks old. She is the sweetest little girl! She potty trained so fast before she was even 9 weeks old. She absolutely has the Beagle nose and howl, which I love. This picture is from the day I adopted her." 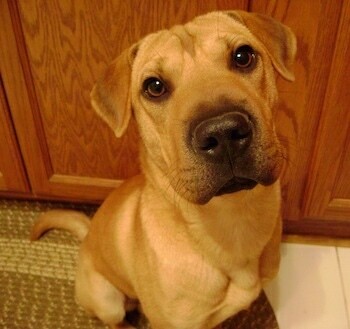 Xena the Sharp Eagle (Beagle / Shar-Pei Hybrid) at 1 year old, weighing 20 pounds—"She is super sweet, but super playful!" 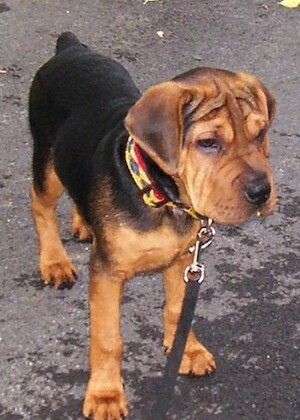 "Cash the Sharp Eagle puppy at 19 weeks—Cash's father is a 16-inch Beagle, and his mother a pure black Shar Pei. He has the look of a Beagle with wrinkles. Cash loves to chew, especially sticks. He is a very laid-back dog, spending most of his time sleeping. When he is awake, he runs around playing with our cat. He has a very gentle, docile nature; wants to be friends with everyone and everything." 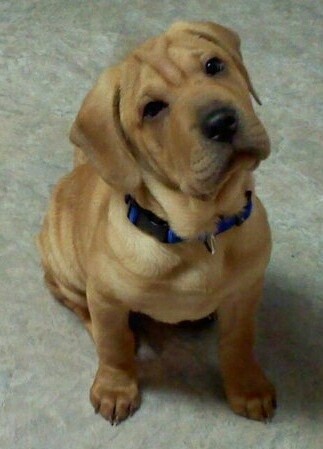 "Stewart is 1/2 Shar-Pei and 1/2 Beagle. 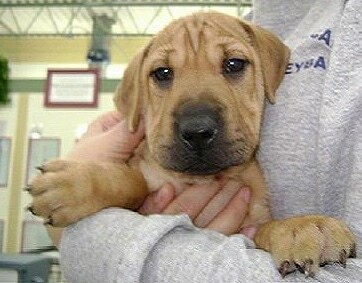 He was the cutest puppy ever with wrinkles, a curly tail and green eyes!! He came from a PA farmer’s market and I couldn't leave without him! He was quite the biter as a puppy, but grew into a regal, sweet handsome boy. He loves the bark park and playing with other dogs. He gets along with all animals including cats!! He is a mama’s boy and a licker full of kisses!! He even puts his arms around you to "hug." 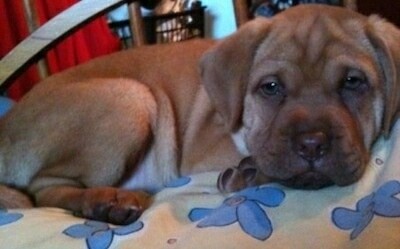 Beauty of the Shar Pei with the sweet temperament of a Beagle. He is a wonderful, loyal family dog!!" 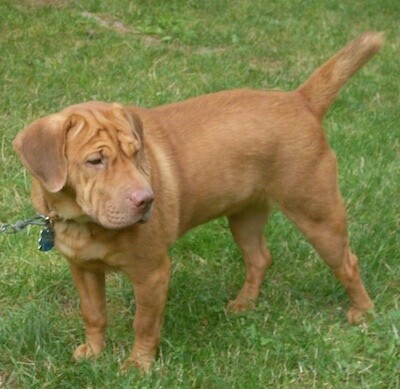 "Lexi is a Sharp Eagle (Beagle / Shar-Pei hybrid) who weighed 22 pounds at 10 months old. She is very playful, energetic and cuddly. We take Lexi to the dog park where she loves to play with all the dogs twice her size and be the first to say "hi" to dogs coming into the park. It has been a little difficult to train Lexi since she is so curious of everything around her, but once she learns, she doesn't forget. The biggest problem we've had is walking. Because of Lexi's Beagle nose, she'd rather pull and smell instead of have a relaxed, enjoyable walk but we watch the Dog Whisperer (Lexi loves to watch TV) and have been using his techniques to teach Lexi how to walk and to show her that my husband and I are "pack leaders." This picture is of Lexi when she was about seven or eight months old." 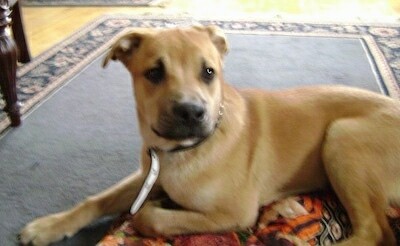 "This is Duke at 6 months old. 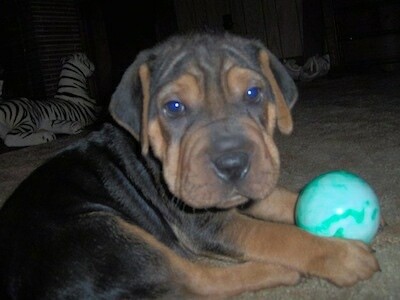 He is a male Shar Pei / Beagle mix puppy. He’s a very well-rounded dog. He’s always happy and loves to play with his toys, especially his duck toys—they’re his favorites. He loves squeaky toys, too. It did not take him very long to potty train or learn to sit. His worst habit would be taking the dryer sheets that fall from the laundry and chewing on them."